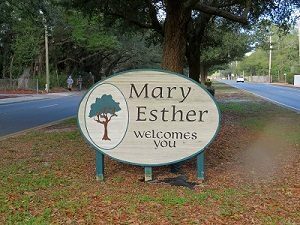 Mary Esther Florida is a small city nestled between Fort Walton Beach and Hurlburt Air Force Base. It is the home to the local Santa Rosa shopping mall as well as several small mature neighborhoods. Though it does not have gulf beach access it is located on the Santa Rosa sound and the city does maintain a small park and boat ramp. Mary Esther is the perfect place to get away from all the tourist hustle and bustle. View all the Mary Esther Florida Real Estate for sale and call me if you have any questions or would like to view a property 850-499-0778. Check out this beach style home with great views of the sound! This beautiful custom built home has 3 bedrooms, each with its own bathroom. Great water views from the kitchen, the living room, and the master bedroom. The roof is made of metal but looks like shingles. Great home in popular location, Just a short drive to Hurlburt Field. Kitchen and Family are very open. Family room has a fireplace. Dining room at the front of the house. Large laundry area. Welcome home to Emerald Pointe, a quiet, well maintained subdivision with neighborhood access to the Santa Rosa Sound. This four bedroom home with a spacious split floor plan has a gorgeous gunite pool and screened back porch. One of the newer homes in the neighborhood, this home is high and dry built on raised land. Enjoy the eat in kitchen with bay window overlooking the backyard. Very Large And Well Maintained Home.72'' Built in Fridge, Chefs Kitchen 6 Burner Gas Stove, Oversized yard, Excellent Neighborhood, Low Traffic, Huge Kitchen, Master and Guest Toilets Are Japanese Toto's around $5,000 each. Japanese Maple And Fruit Trees. You will love this 3BR/2BA home on an oversized lot in Mary Esther! The kitchen features granite countertops, a breakfast bar and upgraded appliances. The spacious master suite is the retreat you are looking for with room for a sitting area. This nice home is in a well established neighborhood just a few miles West of Hurlburt Field. The exterior brick is complimented with cedar wood trimming and washed stone towards the entry way. This home also features a spacious living rom with a wood burning fireplace, ceramic tile in both bathrooms. Location, Location, Location! This beautiful and well maintained all brick home shows pride in ownership. Located in the hidden gem neighborhood of Mary Esther Manor behind Santa Rosa Mall it is one of the most desirable neighborhoods in the area. Homes rarely come available as the neighbors absolutely love it. Only 4 Miles to Hurlburt Field, this conveniently located home has so much to offer! The beautiful custom build provides all of the must haves including granite, tile, stainless steel appliances,cedar toungue & groove ceiling in the main living area, 2 closets in the master suite, with separate walk in shower and garden tub.